Kenny Harrington scores from the penalty spot in Last Hurragh's 3-2 win over Old Bellgate in BSFL's Division Two at the weekend. 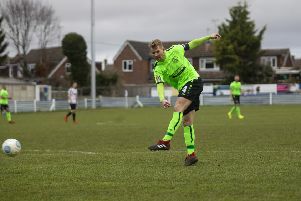 The latest results from the Berkhamsted Sunday Football League’s sides who were in action at the weekend. Boxmoor defend their lead against AFC Aylesbury in BSFL's Division One on Sunday. Aylesbury Flooring 3 (Taylor Collins, Ty Deacon, Vinnie Greco) Real Milan 0. Berkhamsted Tornadoes 4 (Sonny French, 2, Dan Lee, Jack Robinson)Flaunden 3 (George Loosely, 2, Lee Franklin). Maclay v The Gade – postponed. Robin Hood 0 Magpies ‘91 2 (Harry Loakes, Jimmy Evans). Chalfont Saints 2 (Tarek Sebhat, 2) Gossoms End 1 (Will Brookman). Boxmoor 7 (Mitchell Cole, 4, Haydn Cassidy, 3) AFC Aylesbury 3 (Lee Parrack, 2, Sean Potter). Clarkwood 6 (Sean Gray, 3, Bradley Hedges, 2, Ross Adams) Hemel Tudors 3 (Dan Glasheen, Jack Burrows, Scott Bangerte). Jam United 2 (Will Kain, Keii Roberts) Woodhall Wanderers 0. Leverstock Green Athletic 1 (Ben Fisk) The George & Dragon 0. Pioneer 2 (Craig Peterson, Charlie Brooks) GB Precision 3 (Ryan Knapp, Charlie Rance, Connor Lock). Potten End Sunday 2 (Joel Williams, Ned Oskasim) Box Athletic 3 (Reece Elbourn, Dom Holmes, Ross Jenkins). Bowman Athletic 1 (Ben Ryan) Black Horse 0. Chesham Athletic 1 (Martin Severino)The Goat 3 (Ian George, Jack Wood, own goal). Hemel Harriers 0 Berkhamsted Athletic 3 (Sam Conroy, Matt Bunce, Elliot Nichols). Landrovers 0 The Midland 4 (Chris Chance, 2, Alex Harris, James French). Last Hurragh 3 (Gareth Cox, 2, Kenny Harrington) Old Bellgate 2 (Jordan Rogers, 2). Old Amersham 2 (Oliver Bowden, Nathan Hart) Queens Head 0.